If you follow my personal blog you know that my wife is a budding baker and has fattened me with cookies, cakes, muffins and scones. So when her birthday arrived the middle of this month I made a trip to Williams-Sonoma at Boston's Copley Place to pick her up a marble pastry board. My timing was perfect because the store had just kicked off Thanks and Giving to raise money for St. Jude Children's Research Hospital. Thanks and Giving has been a significant cause marketing program for St. Jude since 2004, raising tens of millions of dollars for the hospital. It's also greatly increased St. Jude's visibility with holiday consumers. Cone's Holiday Trend Tracker has Thanks and Giving in third behind the Salvation Army's Red Kettle and Toys for Tots, which combined have been part of the holiday season for over 150 years. St. Jude has a lot to be thankful for. Thanks and Giving is primarily a register program, which means cashiers ask shoppers to donate a buck or more. You've might have seen the green pinups in stores that people can write their names on. I saw them at CVS this weekend. But Williams-Sonoma ain't no CVS so there were no pinups. There wasn't even any signage, except for these register signs, which I'm sure nobody read. What Williams-Sonoma did have is well trained, motivated cashiers that asked every shopper to donate. My cashier told me the kitchen supply store hoped to raise $10 million, an amount, she said it fell slightly short of last year. I visited the store twice. On both occasions they asked everyone at the register to donate. They also left it up to shoppers to decide what they wanted to donate. I donated a buck, but the woman beside me donated ten. The cashier said that a lot of shoppers were rounding up their purchase to the nearest dollar or ten. With each donation, cashiers also rang a little bell in celebration. Nice (because everyone knows every time you hear a bell ring an angel gets its wings). Here are the key takeaways from Williams-Sonoma's execution of Thanks and Giving. The ask is everything. No signs, pinups, posters, buttons, fliers. The most important thing is the cashier asking the shopper to give. While every register at the store had credit card machines with the Thanks and Giving logo on it, they don't get reach into shoppers' wallets. Technology informs, it facilitates. It doesn't persuade. That's when you need a human being asking the question, "Would you like to donate to St. Jude?" Retail is retail. I admire Williams-Sonoma for doing register programs. So many retailers dismiss cause marketing because they think their clients are too upscale or it won't mix well with their brand. Retail is retail. If Williams-Sonoma can do register programs (and Brooks Brothers too, which has raised $3 million for St. Jude) anyone can. With upscale stores, leave the ask amount open. I've written before that I think limits in cause marketing work, but in some settings, like upscale stores with affluent customers, you may raise more by leaving the ask amounts open. I'd love to hear from someone else that has more experience working with upscale retailers on cause marketing programs. Trained staff gives you a big edge. This is another topic I've written about. 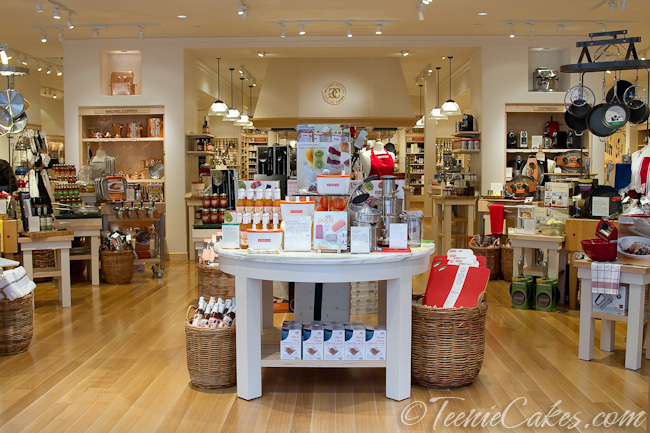 What I saw at Williams-Sonoma supports that trained and motivated staff can offset the hit you'll take from dips in foot traffic. We all want department and grocery stores as cause marketing partners because they have lots of foot traffic. But you shouldn't write-off stores with less foot traffic if they have well trained and motivated staff. Yes, they see fewer customers, but they'll get more yeses. Brand, brand, brand. I wish I had asked, but I wonder just how many shoppers knew anything about St. Jude beyond the warm, fuzzy, kid-friendly brand that envelopes it? I wonder how many could tell me that St. Jude is in Memphis? That it had just 78 beds? No matter. The name itself warmed the heart and loosened the purse strings. That's the kind of consumer experience we should all be striving for.